Many believe those who are not working are doing so because they get enough government benefits to make staying at home a better option. Although there are some antidotal examples that support that opinion, there are no reliable data to back that opinion up as a primary reason. Current Census estimates for the Tri-Cities show almost one-in-three people age 20 through 64 didn’t work in 2016. And the age group with the largest share of those who didn’t work were 55 to 64, typical the years for highest earning. The numbers are a little better than our last visit to the American Community Survey’s (ACS) five-year estimated since they are from the 2016 ACS one-year study. The one-year estimate is more reflective of current conditions since they are not an aggregate of five years data. It should also be noted that while employment improved in 2016, we’ll have a much better picture of the labor market when the 2017 numbers come out since job growth was strongest in the first half of 2017. That report will be released early this fall. For 2016 reports on who worked and who didn’t I excluded the 16 to 19-year-olds since those are prime school years. I also excluded those over 65 although many in that age group are still working. Everyone is included in the chart for those who want the big picture. There are about 293,890 people ages 20 to 64 in the seven-county Tri-Cities area, and 81,702 of them (27.8%) didn’t work in 2016. The number of Tri-Cities residents who didn’t work in past 12 months according to the one-year American Community Survey report. Drill down to the metro area, and 29,196 in the 20-64 age group were in the three-county Johnson City Metropolitan Statistical Area (MSA). That’s 32% and about what you would expect for an area heavy in four-year colleges and universities. 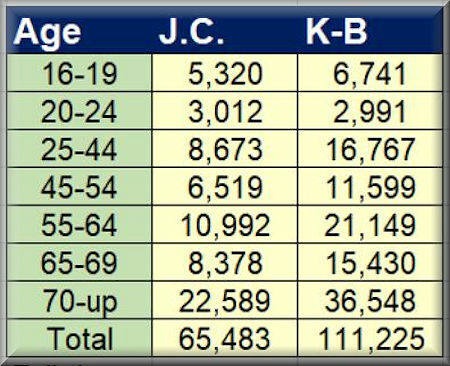 In the four-county Kingsport-Bristol MSA, 29.8% (52,506) of the people in this age group didn’t work. The number of working age people who didn’t work is an issue because the region’s labor force participation rate has declined. A good rule of thumb is if you have less labor force participation, you’re going to have less economic growth unless it’s augmented with technology or higher productivity. And productivity in the Tri-Cities – as measured by per capita gross domestic product – is not growing. It’s down $3,719 from the previous high in Kingsport-Bristol and $1,917 in the Johnson City MSA. In 2016 the Johnson City MSA saw a half-point dip in real GDP after a year of solid growth in 2015. But the Kingsport-Bristol MSA has seen year-over-year declines for four straight years. There’s a number of reasons for the decline. But the biggest is the region has been hit by a triple whammy of slow recovery from the Great Recession, a rapidly aging population, and stagnant – negative in all but two counties – population growth. Currently, about 22 area residents turn 65 every day, and that will continue for a decade or so. And for every live birth, there are 13 deaths. But when you drill down on the numbers of those who didn’t work you quickly see that there’s something else at play. According to Census data 50,259 people 45 to 64 who should be in their peak earning years did not work. That’s 34.4% of everyone in that age group. The ACS doesn’t tell us why the people didn’t work. Some are likely physically or medically unable to work. According to current Social Security information, there are 32,435 people collecting disability – but that number isn’t broken down by age. (The just-released supplemental data tables for the ACS 2016 1-year estimates there were 57,742 individuals with a disability in the Tri-Cities. That an estimate of those with a disability, not those who have who qualified for SSI.) And even if all of them were in the 45 to 64 age group that still leaves about 20,000 who didn’t work in 2016. A popular prejudice among many in the area is the group of people didn’t work because they receive too many government benefits, but there’s little besides anecdotes and class prejudice to substantiate the opinion. So why does the subset of workers who didn’t work get so much attention? Simple, they are among those on the front edge of the demographic change that will set the economic tone for the Tri-Cities for the next 20 years. Here’s the big picture: 50,259 in the prime working years age group of 45-64 didn’t work; 69,370 worked full-time, and the 26,483 worked part-time in 2016. That number of part-time workers means a little better than a third of the local jobs are part-time or contract labor. The national number is about one-in-four, but that’s another story. One that we’ll look at in an upcoming report that attempts to benchmark the new economic normal for the Tri-Cities and its two metro areas. Don, this is interesting data. Do you know if this trend is also true on the national level or is just regional? My focus is local, but there has been quite a bit written about the national labor force participation issues in relation to the nation’s demographics. Our region is ahead of the rest of the nation on the aging demographic trend but without some big increases in population, it will become a bigger national problem in the not-too-distant future.